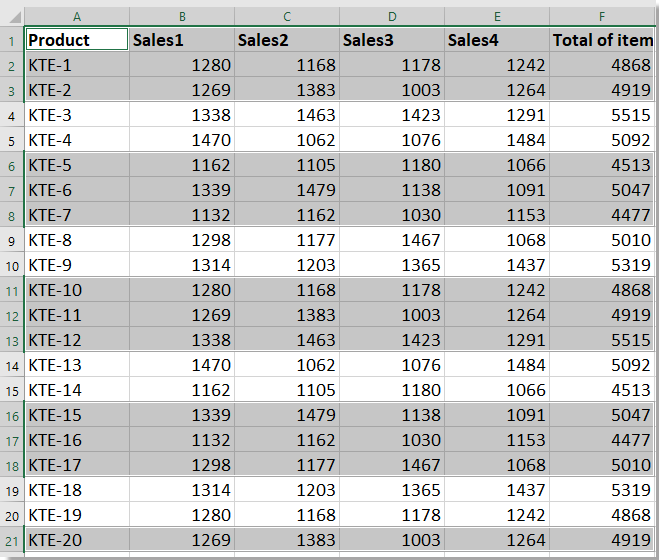 How to select every other or nth row in Excel? When we use a worksheet, sometimes, we need to select the every other or nth row of the sheet for formatting, deleting or copying purpose. You can select them manually, but if there are hundreds of rows, this method is not a good choice. Here are some tricks to help you. 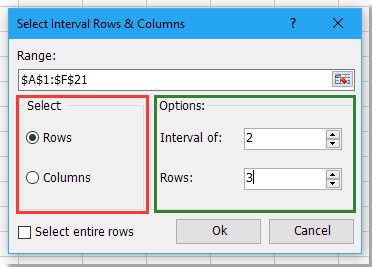 With the Select Interval Rows & Columns utility of Kutools for Excel, you can quickly select every other or nth rows/columns by settiing the references in Interval of and Rows/Columns sections. Free download! Kutools for Excel: with more than 300 handy Excel add-ins, free to try with no limitation in 60 days. 1. Highlight the range that you want to select every other or nth row. You can change the interval as you need in the second KutoolsforExcel dialog. 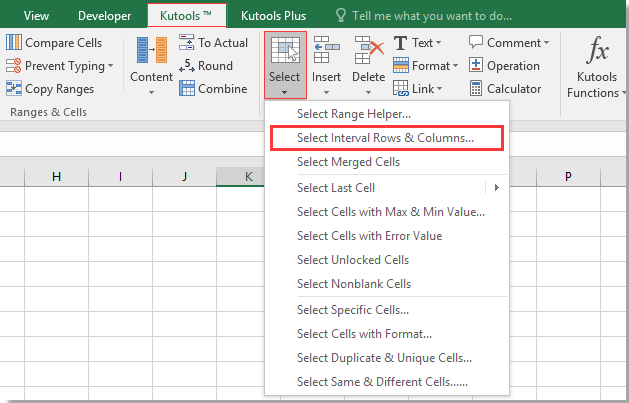 With VBA code, you can only select one row with specified intervals, if you need to select two, three or other rows with specified intervals, the Kutools for Excel can help you solve this problem easily and conveniently. 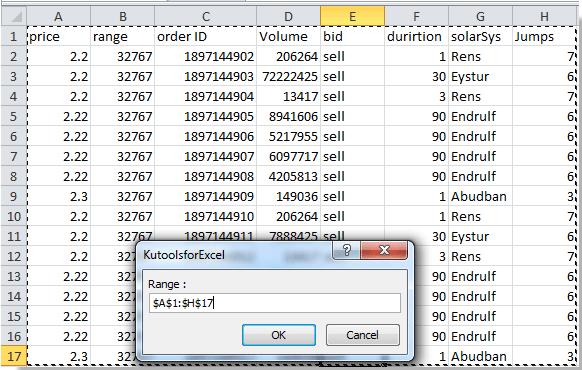 Kutools for Excel, with more than 300 handy functions, makes your jobs more easier. 1. If you need to select every other row in the selection, please enter 2 in the Intervals of Input box and 1 in the Rows input box. 2. If you want to select the entire row that you need, you can check Select entire rows option. Kutools for Excel: 300 + functions you must have in Excel, 60-day free trial from here. 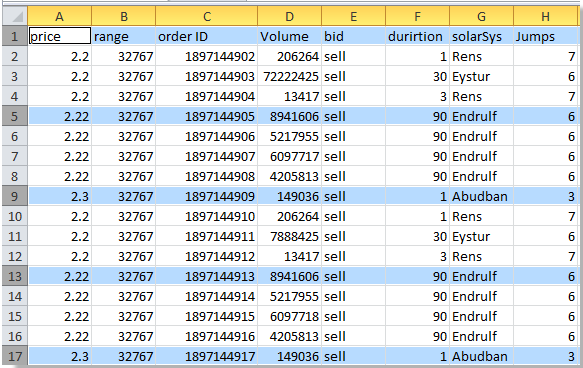 If you want to shade ranges in every other row so that the data looks more outstanding as below screenshot shown, you can apply Kutools for Excel’s Alternate Row/Column Shading function to quickly handle the job. 1. Select the range of cells you want to interval shade, click Kutools > Format > Alternate Row/Column Shading. 3. Click Ok. Now the range has been shaded in every nth row. 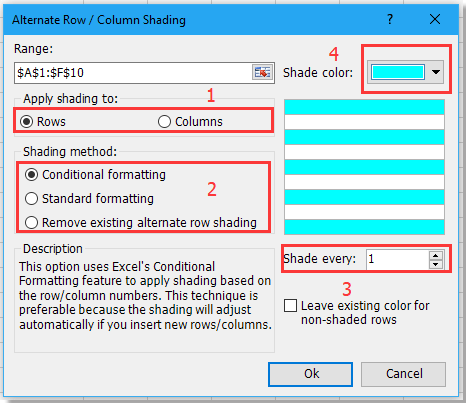 If you want to remove the shading, check Remove existing alternate row shading option in Alternate Row/Column Shading dialog. Tabbed browsing & editing multiple Excel workbooks/Word documents as Firefox, Chrome, Internet Explore 10! You may be familiar to view multiple webpages in Firefox/Chrome/IE, and switch between them by clicking corresponding tabs easily. Here, Office Tab supports similar processing, which allow you to browse multiple Excel workbooks or Word documents in one Excel window or Word window, and easily switch between them by clicking their tabs. Click for free 45-day trial of Office Tab! Help, please. This looks great, BUT when I hit the > Run button it fails with a "Compile error: Sub or Function not defined" and the code stopped at "Set rng = InputRng.Rows.Count Step xInterval +1". Not sure that I will be able to help, but..
First of, there is a spacing between "C" and "ount" in "Count" when i copied your code string over to a module. Secondly, I can´t find your code anywhere else on this page, please submit the whole thing, if the problem remains. The code has one request. Does it have to select the ENTIRE ROW for each nth row? Can't it just select certain cells (range of cells) within each nth row? I don't need all the information in each row. Just certain cells of each nth row. thanks a lot.it works perfect.I have more than 7000 data that need to select them with different interval.this trick was like a miracle for me.thaaaaaaaanks.